Enough has been speculated on the much anticipated Royal Enfield 750cc bike. 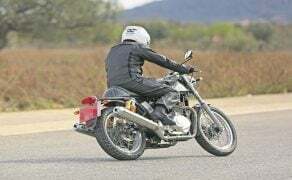 This upcoming Royal Enfield motorcycle was recently spotted testing by Motorcyclenews.com. 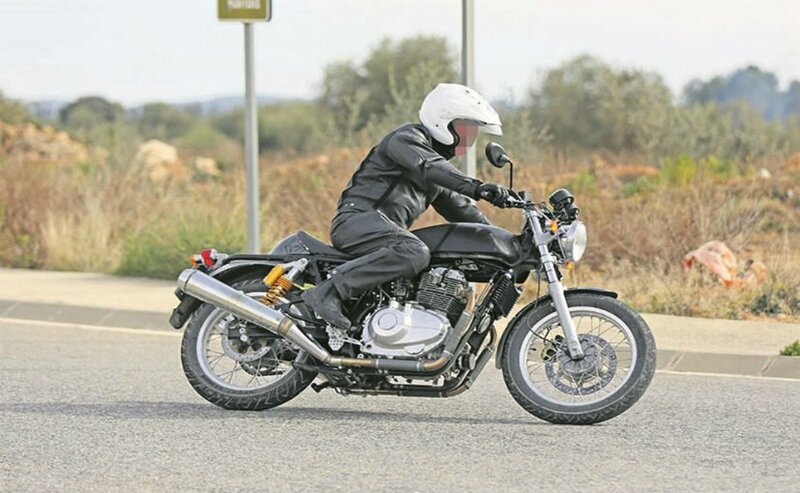 These spy pics confirm that road tests of the upcoming 750cc Royal Enfield have commenced. 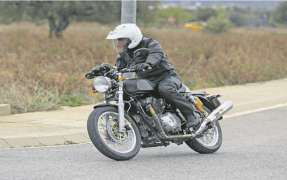 As seen in the images, the engine is being tested on a Continental GT 535 cafe racer. The test mule is a bit longer than the standard bike to accommodate the bigger engine. Details on the upcoming Royal Enfield 750cc bike are scarce at the moment. 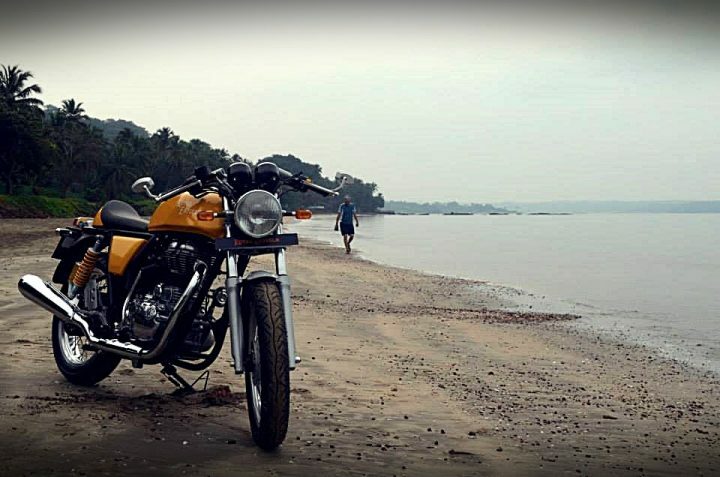 However, you can read on for all that’s available on the 750 cc Royal Enfield motorcycle. Details are really scarce on the upcoming Royal Enfield 750cc bike. It is not even clear if the 750cc parallel twin would find home on a Continental GT, a Himalayan or an altogether new bike. But what’s pretty much for sure is that this bike is definitely coming to India. We are guessing that the Royal Enfield 750cc bike India launch date will fall somewhere in the early months of 2018. Once launched here, the bike will be pitted squarely against the Harley Street 750. We don’t have many more details at the moment. However, easily expect the upcoming Royal Enfield 750cc bike to cost around INR 3 lakhs when it goes on sale in India. While this would make it the most expensive RE motorcycle, it will still hold a definite edge over, say, the Street 750. Thanks to local manufacturing, the bike will enjoy a great pricing advantage. We feel that this 750cc Royal Enfield motorcycle can play a huge role in bringing high displacement biking closer to the masses. As can be seen in the images of the 750cc RE that we have here, the parallel-twin engine on the test bike is a carburetted unit. Now this is something that was unexpected to say the least. We say this because it might get tough for Royal Enfield to meet the BS4 emission norms. Even the Himalayan Adventure Tourer, whose engine is a BS3 unit, wasn’t allowed to be on sale in New Delhi initially. However, it is likely that this arrangement is only for the initial testing phase. In all probability, the upcoming Royal Enfield 750cc bike would be fuel injected. While a carburetted engine would have offered the charm and typical characteristics of an old-school bike, a fuel injected unit has lower emissions and better power delivery.. The new 750cc engine from Royal Enfield will help it battle it out with the likes of Harley Davidson Street 750. It was earlier rumoured that the upcoming engine would have a V layout. However, it is now for sure that it will be a parallel-twin instead of a V-twin. This layout ensures that the new 750cc engine doesn’t require much space to be accommodated in an existing RE’s frame. Also, thanks to the large displacement, RE has decided to use an oil-cooler instead of air-cooling. The 750cc Royal Enfield has already been caught testing many times. Seen above are the latest addition to the spy images. 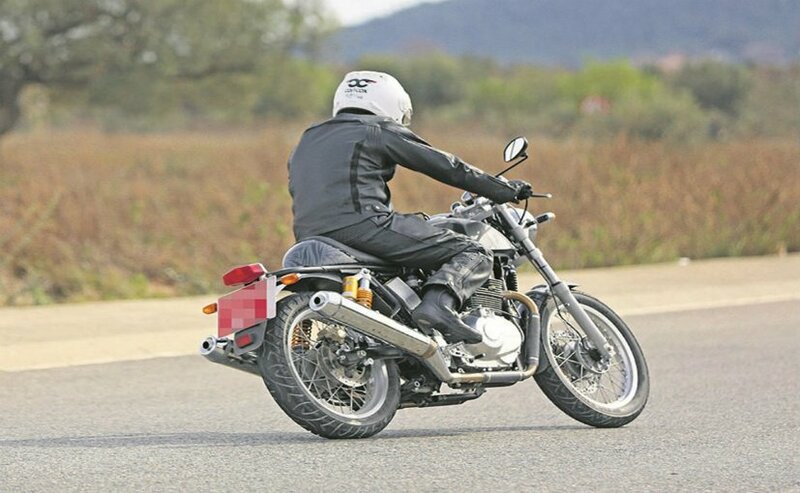 Royal Enfield seems to be testing its upcoming 750cc engine in the Continental GT’s frame. However, it’s stall not known if a 750cc Royal Enfield Care Racer is coming our way. Thanks to the engine’s V-layout, the existing frame doesn’t require heavy modifications to accommodate the new engine. We have always loved the Continental GT for its good handling characteristics and the oodles of old world charm it presents. We’ll be really happy to see RE launching a 750cc Cafe Racer in India. Not much is known about the upcoming Royal Enfield 750cc bike. However, stay tuned to CarBlogIndia for more images and updates on the Royal Enfield 750cc bike Specifications, India Launch Date, Mileage and Price.